Report from Oxford Research Denmark show that a new EU directive on earmarked paternity leave can lead to a series of positive effects. The European Parliament has approved a directive on work-life balance that gives earmarked parental leave for men in April 2019. We, at Oxford Research Denmark, have in years worked with analyses on parental leave both nationally and internationally. The analyses give an indicator of what will come of the earmarked paternity leave. Mothers take far more leave than fathers. On average Danish mothers take 298 days of maternity leave while fathers take 31 days leave. Different actors, including the government work to further fathers’ use of paternity leave. The arguments to further the amount of leave men take is first of all about equality between men and women. At the same time, it is evident that it also has a positive effect on the child’s development. There is a development toward men taking a still larger part of the parental leave. In Denmark we have seen a continuous rise in paternity leave since 2004 while the use of maternity leave has been more or less consistent. Oxford Research Denmark assessed of the effects of the use of paternity leave in 2018. The report is made in collaboration with the University of Southern Denmark and the Minister for Gender Equality. The report showed a series of positive consequences of men’s use of parental leave. Paternity leave is a factor that, together with other initiatives to further a good working environment, is a component in furthering recruitment and retention in businesses. It also creates a stronger relation between father and child, and it strengthens the domestic division of roles between parents. 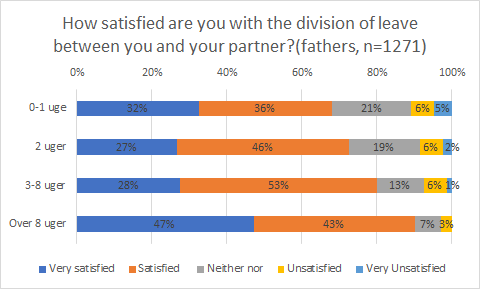 The report also showed that the longer leave fathers take the more satisfied are the parents with the division. That’s the case with both fathers and mothers – both parties are more satisfied the longer leave the father has had. At the same time, it is noticeable that almost all (96%) fathers that are not satisfied with the division of parental leave between themselves and their partner would have liked to have had more leave, while a considerate part of the mothers (40%) would like to have taken less leave. The results point toward a positive reception of the earmarked paternity leave within Danish families and can contribute to a higher satisfaction with the division of parental leave. Oxford Research Denmark have through our function as correspondents for Eurofound been working on a report that investigates paternity and parental leave in the respective EU countries. The report was commissioned by the European Commission’s Gender Equality Unit to lay out the respective EU countries’ parental leave structures. One of the specific objectives of the report was the desire ‘to increase take-up of family-related leave and flexible working arrangements by men’ and to assess what the current status of paternity and parental leave was. The European Commission reached a deal in 2018 that is to give fathers ten days leave around the time of birth and two of the minimum of four months parental leave is to be earmarked the father. It is this deal that the European Parliament now has voted for. All EU countries thus have a system for payed paternity leave around the time of birth and afterwards. Oxford Research Denmark are currently working on a dialogue-based tool to create debate on paternity leave. This is because we have seen that the use of paternity leave is partly about knowledge of rights and partly about the concrete work place culture. With this tool it is sought to create a continuous focus on the possibilities in the working community to further make use of the rights to paternity leave.